Enter a world of color, culture, and cherished spiritual tradition of India. Your guided tour of India and Ganges River cruise begins in the Southern India city of Cochin, where you’ll take a cruise on the backwaters of Kerala to witness life along the scenic and serene waterways. Explore Mumbai, home to "Bollywood," and Varanasi, to watch the Hindu’s devotional bathing in the Ganges. Continue on to the bustling city of Delhi. You’ll tour the city with your expert local guide, and take a rickshaw ride through the Chandni Chowk bazaar-brimming with everything from silver and spices to saris of every color. You’ll visit Qutub Minar-the world’s largest brick minaret, and see Delhi’s largest Sikh gurudwara (house of worship), before traveling to Agra-site of the legendary Taj Mahal. 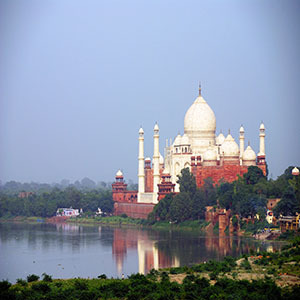 Join a sunrise excursion to the Taj Mahal-the iconic memorial build by Moghul emperor Shah Jahan for his beloved wife. More than 20 years in the making, the Taj Mahal stands as the pinnacle of love’s devotion, and is also yours to experience at sunset if you wish. In Jaipur, see the famous Palace of the Winds, and tour the spectacular Amber Fort, before flying to Kolkata to board your Ganges river cruise. The holy river of Hinduism, the Ganges, slowly courses through one of the world’s most fertile and populated areas. Along its banks, human life is connected to its waters and you’ll get a glimpse of life away from India’s big cities. See muslin weaving in Kalna and candy making in Matiari. Stop in Murshidabad for an excursion to Azimganj and Jiaganj-to savor authentic Indian tea, as well as stunning gold and silversmith workshops. You’ll meet saree weavers, goldsmiths, and pottery makers. You’ll also visit the fascinating Hare Krishna headquarters in Mayapur, and visit Saint Mother Teresa’s former home upon your return to Kolkata. Day 3 Cochin–Mumbai: Fly to Mumbai. Day 4 Mumbai: See the Gateway of India; visits to the Hanging Gardens, Mumbai Museum, and Mani Bhavan. 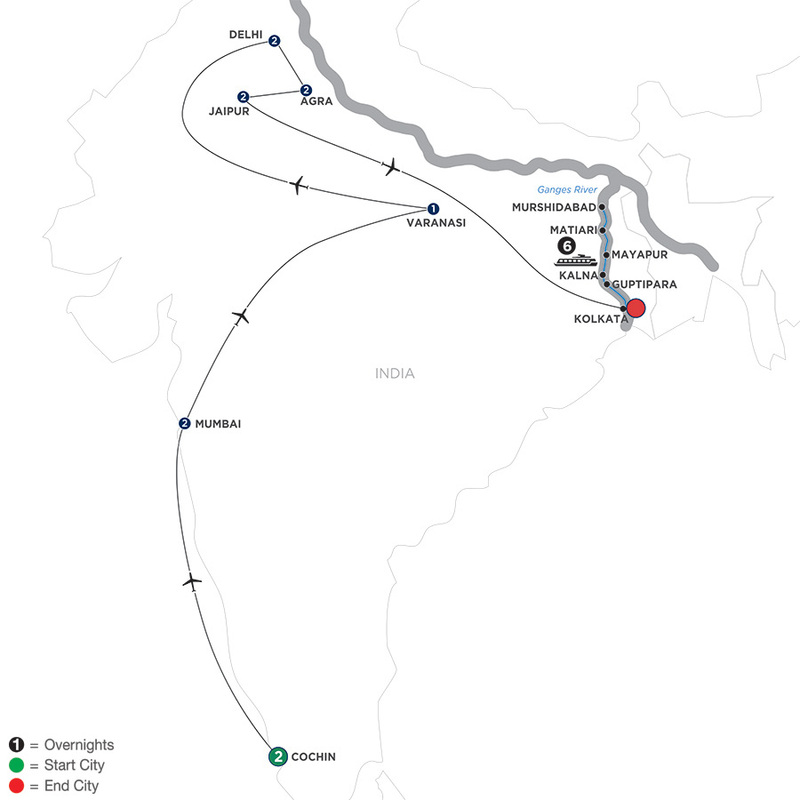 Day 6 Varanasi–Delhi: Watch the Hindus’ devotional bathing ritual; excursion to Sarnath; fly to Delhi.